yarn spinner: Sunglasses at night? We're into the really dark days here in Winnipeg. Although our temperatures have been warm (almost 0C! 32F! ), I checked and we are in the period where we get around 8 hours of daylight each day--if we're lucky. If it's sunny and not cloudy. Dark. This accounts for why all my blog snapshots seem so dark. We returned (almost a week ago) from an enormous family event in Virginia. Each of us needed multiple dress outfits and everyone was on his best behavior. It went smoothly, but short version is that we're exhausted... I am still in recovery. The suitcases have been emptied, everything was washed and put away. I even managed to knit a bit this past weekend. 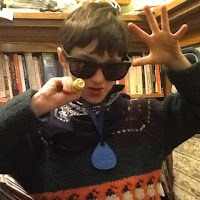 However, if I didn't have, say, twins in grade 2 and two bird dogs? I would have just spent a lot of time napping in bed or on the couch. This is a season for us when nothing much is happening. What? Wherever I go, adults around us seem to be in a tizzy. However, our holiday has passed and what a relief! Now we're now going to take it easy. I made a simple dinner a few days ago and thought I'd show you it here. 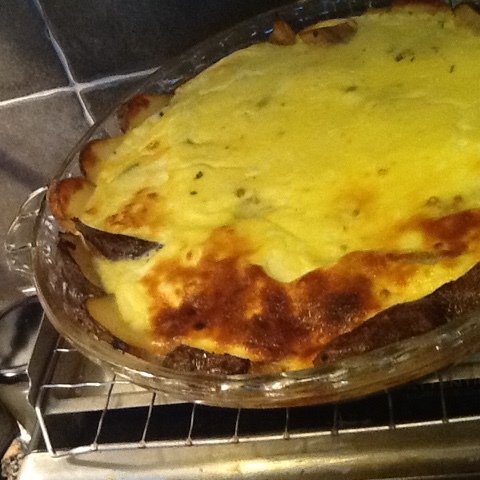 I took leftover cooked potatoes, sliced them, and placed them in an oiled pie pan like a crust. Cooked in the oven at 350F until the rest of the pie was ready. 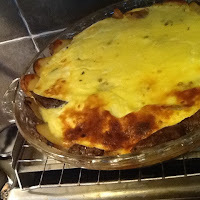 I then put down some shredded mozzarella and cheddar I had, on top of the potatoes. I beat three eggs with about a cup of milk and plain yogurt, combined. (Either kind of dairy works...) I added some garlic powder, salt, greek herb blend (Italian would also work fine) and poured it on top. I baked it in the oven again for about 30 minutes. I served it with a salad and some veggies and everyone seemed very happy. It would also go well with soup. A few weeks ago, I made some mitts out of leather scraps as part of my ongoing attempt to keep small hands dry as well as warm. It seemed like a good layer between wool mitts. When you sew mitts out of leather, you have one chance to get them to fit. I managed to make passable mitts that fit one out of two twins well. (I tried.) 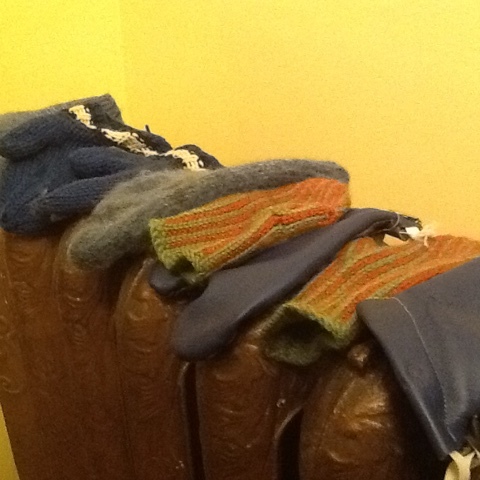 Even so, this warm and damp weather is perfect for playing in snow, so our radiator is doing overtime as a drying rack. This is what it looks like on the average morning right now. You may recognize the green and orange mitts? They are The Hole Inside Mitts. There is definitely still time to knit up a pair of these, particularly in the small sizes! Finally,we came home from Virginia with two gorgeous handknit sweaters made by my mom. They were also extra long though, and umm, if you have little boys, you may know that this can cause difficulties in the bathroom. :) However, at least one twin begged to wear the new sweater right now. So, I did a very sneaky thing. I asked my mom for some of her leftover yarn. 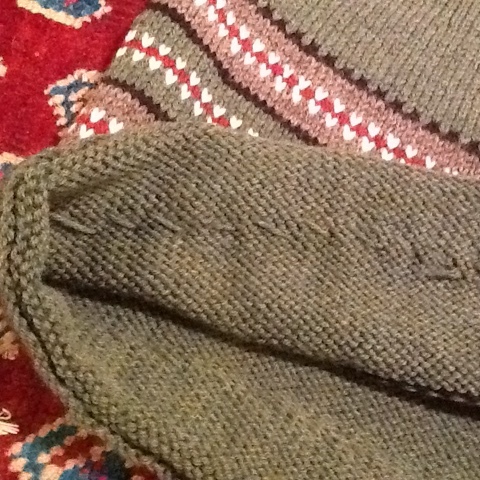 I then folded over the extra fabric on the inside of the sweater, and did an invisible basting stitch. I buried the ends of the sewing yarn inside the folds, but used no knots at all. 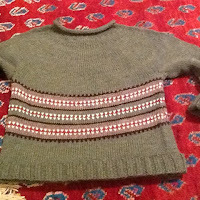 From the front side, you cannot tell I hemmed the sweater at all. When the kid grows, I will pull out this basting seam, wash the hand knit by grandma sweater---and it will magically grow longer. A great solution. My apologies for these poor photos. It is sunny out right now, but sadly, I seemed to have missed the sunshine when it came time for quick blog photos...soon it will get brighter out, a little more every day! It does--every year...I have to remember to be patient!